Want to help make Bushiroad tournaments the best they can be? 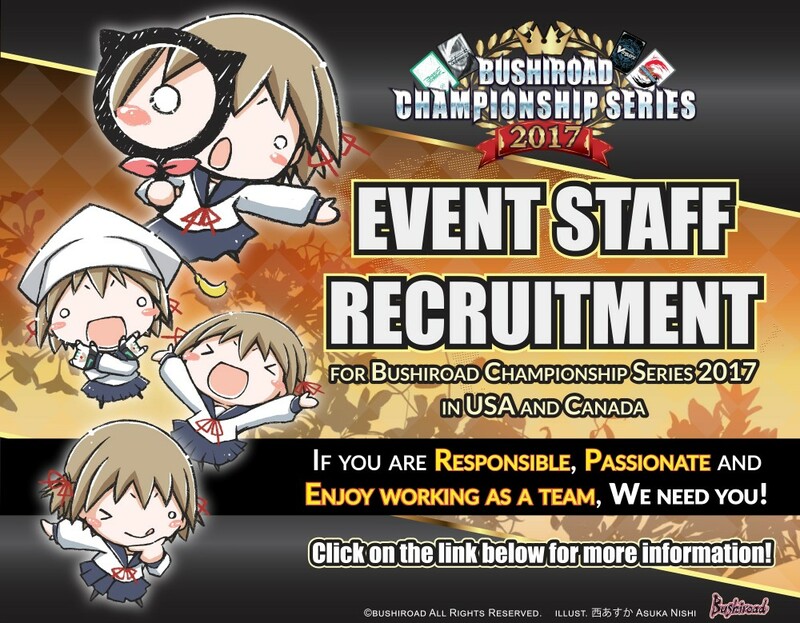 Bushiroad is recruiting event staff for our event in the USA and Canada! Event staff will be expected to work the full duration of the event with breaks. Basically, you may not only work half the event and leave. Event staff, especially newcomers, are expected to attend a meeting Friday evening before the event in order to receive training. Event staff will be compensated for the hours they work. Event staff will be given all PR cards given to attendees at that tournament, as well as whatever the goodie bag given to attendees contains. If you are interested, please fill out the form HERE. Should you have any questions feel free to or call us at (909) 869-9199 during business hours (PST)!